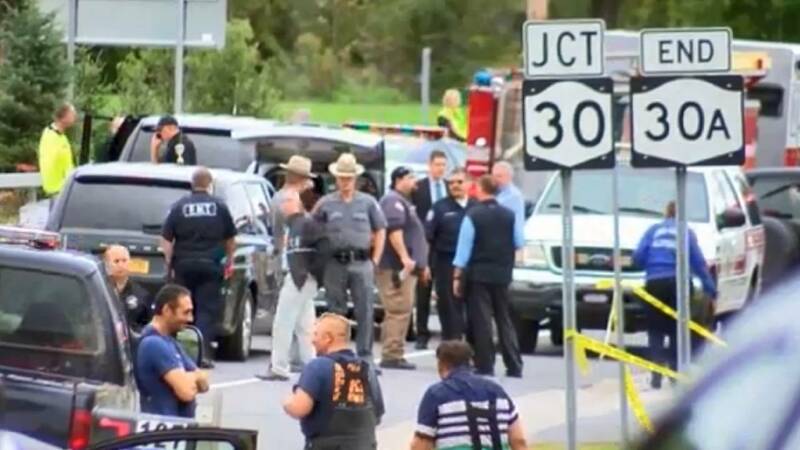 (CNN) - Authorities charged a limousine company owner's son with criminally negligent homicide Wednesday in connection with the weekend crash in upstate New York that killed 20 people, according to a New York State Police statement. Nauman Hussain, whose father, Shahed, owns Prestige Limousine Chauffeur Service, was arrested during a traffic stop on Interstate 787, New York State Police said. Nauman Hussain is an "operator" for Prestige, police said. The 28-year-old received "written violations" from State Police and the state Department of Transportation informing him that the driver "should not have been operating the type of vehicle involved in Sunday's crash," State Police Superintendent George Beach told reporters. The state DOT had also ordered the stretch Ford Excursion involved in the wreck be taken out of service in September, Beach said. "The sole responsibility for that motor vehicle being on the road Saturday rests with Nauman Hussain," the superintendent said, adding that more charges and arrests are possible. As Nauman Hussain was being processed at a trooper barracks in Latham, attorney Lee Kindlon, who represents Prestige, said his client was innocent. The younger Hussain pleaded not guilty during his appearance Wednesday night in Schoharie Town Court, Kindlon told CNN affiliate Spectrum News. Hussain posted a $150,000 bond and surrendered his US passport, according to his attorney. Asked if he knew whether police planned to arrest Shahed Hussain, Kindlon replied, "I had no idea that this guy was going to be charged today." Shahed Hussain handled the company's day-to-day operations, including maintenance, Kindlon said, while Nauman Hussain handled some marketing and booking, answered the phone and had "very little involvement" in the company. Kindlon expressed frustration over the charges, saying it would hamper his clients' abilities to provide information in the investigation into the crash. They had previously been cooperating with police and state and federal officials, he said. The attorney accused state police of "jumping the gun." "Frankly, now my criminal defense side has to jump into action, and unfortunately, from this point I have to advise my clients it's their right to remain silent and, at least right now, we can't cooperate with the investigation going forward," he said. He said the state faces potential liability in the crash -- there have been questions, for instance, about the safety of the intersection where the crash occurred -- and suggested the arrest was the state's way of saying, "Look over there. It's not our fault." The arrest came as state officials and Kindlon offered conflicting accounts on whether the converted limousine should have been on New York's roads in the first place. Gov. Andrew Cuomo flatly stated this week that the vehicle failed a state inspection, meaning it shouldn't have been in service, and that the driver did not have a proper license to operate the vehicle. Kindlon says neither claim is true. For its part, the state DOT concurs with Cuomo and the state police, and federal records from a September inspection indicate the automobile was deemed unfit to drive. Kindlon said the state DOT conducted a periodic inspection last week and found minor infractions, including a broken window latch and faulty windshield wipers, but the issues were fixed. The DOT ruled the limo "roadworthy" last week, he said. "I respectfully disagree with Gov. Cuomo. I would just ask for the investigation to take place so we can figure out exactly why the vehicle crashed," Kindlon said, adding that no recent failure or minor safety issues led to the crash. State DOT spokesman Joe Morrissey, however, called the assertion that the limo had been cleared to be on the road "categorically false." Kindlon also contends that the driver -- Scott Lisinicchia, 53, of Lake George -- was properly licensed, and that Prestige had checked multiple times with the state Department of Motor Vehicles, which confirmed Lisinicchia was in compliance. Lisinicchia, who worked for Prestige as needed, had been with the company for years, the attorney said, and was a "very reliable employee and a great driver." Investigators have said that determining Lisinicchia's state -- namely, whether he was impaired or fatigued in any way at the time of the crash -- will be integral to their probe. The driver's brother, Keith Lisinicchia, told CNN affiliate WRGB that Scott Lisinicchia also drove tractor trailers and dump trucks and took his job seriously. He can't see his brother driving without the proper license, he told the station. "I know that he always made sure that it was valid and was in order," he said. The driver's wife, too, says he was an excellent driver and told CBS that she doesn't understand why there is so much focus on the license "because even if he didn't have the proper license, this still would have happened, and I feel like he still would have got blamed." She said Prestige "should've been more responsible" when it had people's lives in its hands, according to CBS. CNN's attempts to reach Kim Lisinicchia have been unsuccessful. Grant & Longworth, a law firm with which she has consulted, said in a statement the family requests privacy. "The family believes that unbeknownst to (Scott Lisinicchia), he was provided with a vehicle that was neither roadworthy nor safe for any of its occupants," the statement said, without elaborating. Prestige is looking into Lisinicchia's history as part of an internal investigation, Kindlon said. It's also collecting maintenance records, driver logs and ownership records, which it will turn over to authorities, he said. Local, state and federal investigators are still trying to figure out why Lisinicchia plowed the Excursion through a stop sign and into a parked SUV on Saturday. A focal point of the investigation will deal with the aftermarket modifications involved in converting the Ford SUV into a limousine. Investigators will also home in on the company's history. Authorities seized three of the company's vehicles, as well as the modified limo involved in the crash, State Police Maj. Robert Patnaude said. Kindlon says the vehicles taken off the road were sold or transferred, while those with safety or mechanical issues were repaired and returned to the fleet. But records from a September 4 inspection show the Excursion was taken "out of service," meaning it was prohibited from being on the road because it posed a hazard. Among the problems behind that designation were a lack of or defective emergency exits, seating in excess of the manufacturer's designed capacity and an unspecified violation of the requirement to keep records dealing with inspection, repair and maintenance of parts and accessories, according to the Federal Motor Carrier Safety Administration. The inspection also yielded seven lesser violations that did not warrant the vehicle being taken off the road. Among them: improper display of the carrier's name and/or federal DOT number, registration or license plate violation, a problem with the hydraulic brakes, inoperable or defective windshield wipers and a failure to repair defects noted in a previous inspection. "When we get to brewery we will all b deaf," she wrote, the Times reported. The wreck has placed Prestige Limousine Chauffeur Service and owner Shahed Hussain under scrutiny. He is currently in Pakistan, a destination to which he travels frequently, Kindlon said. "He is ready and able to come back whenever they need him," the attorney said. "His heart is broken and his family's heart is broken. ... Anything that he can do to make this right, he'll do, and he's so very sorry for everything that's happened."